Fresh air, blue skies and a true Colorado experience awaits you in our Rocky Mountains and 80% public lands. Buena Vista is renowned for its Collegiate Peaks Wilderness Area with its 165,864 acres, much of which lies within the San Isabel National Forest. 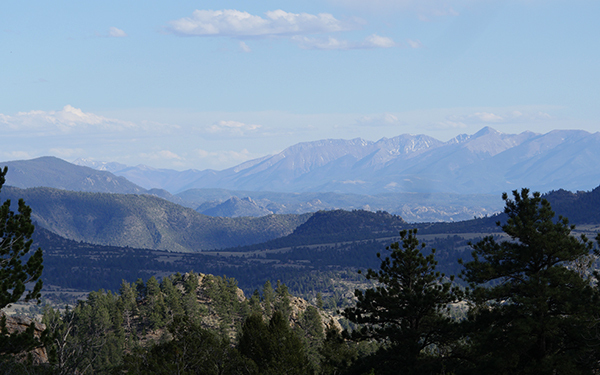 This wilderness area holds a collection of Sawatch Range Mountains and is set in the Buena Vista valley. 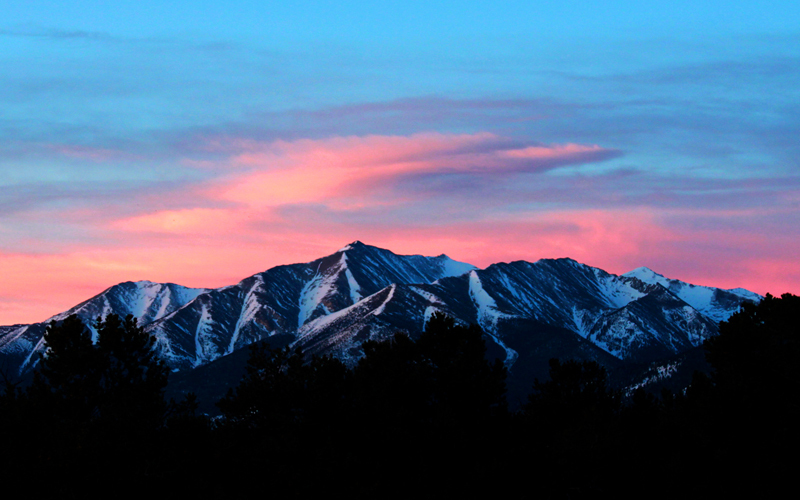 The Sawatch Range contains some of Colorado’s highest peaks and provides magnificent views that inspire both visitors and local residents every day. 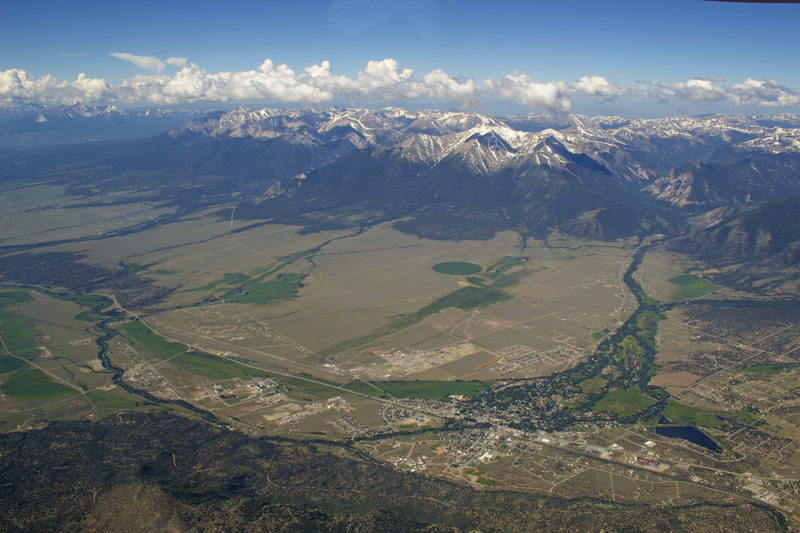 Many of these peaks are named after universities, such as Mount Princeton, Mount Columbia, Mount Harvard and Mount Yale, earning the title “Collegiate Peaks”. Enjoy this book “Hiking Buena Vista, CO.” Below on this page are trail instructions for eleven of our most popular hikes! If advanced mountaineering isn’t your aim, numerous beginner and intermediate hikes are available in the Buena Vista area and serve as great family options. 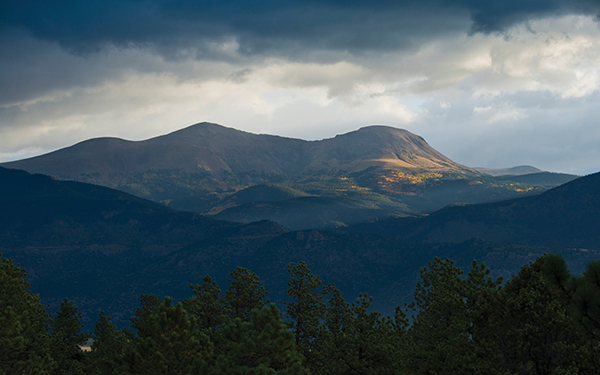 These hikes offer stunning views of the Collegiate Peaks. 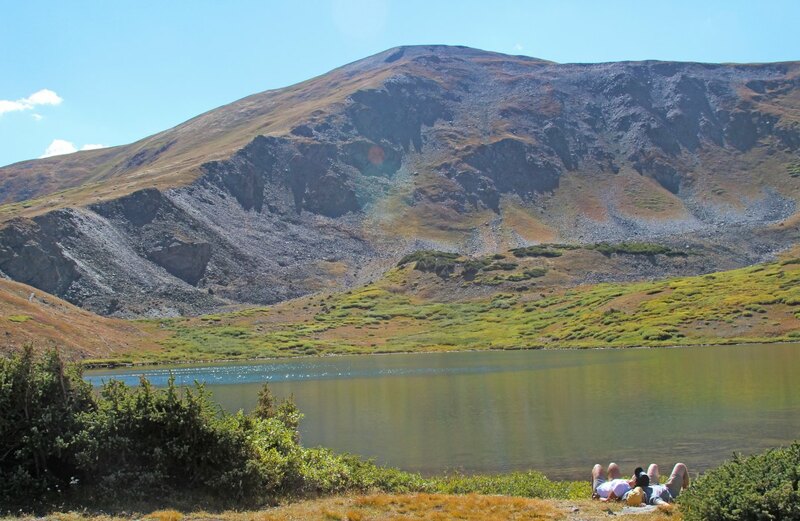 The many lakes near Buena Vista also offer beautiful hiking destinations, such as Ptarmigan Lake, Hartenstein Lake, Clear Creek Reservoir, and Twin Lakes. You can even hike the amazing trails at the end of East Main Street in downtown Buena Vista, such as the Arkansas River Trail or the Midland Trail; both are good options for families and those who don’t want to trek far out of town. 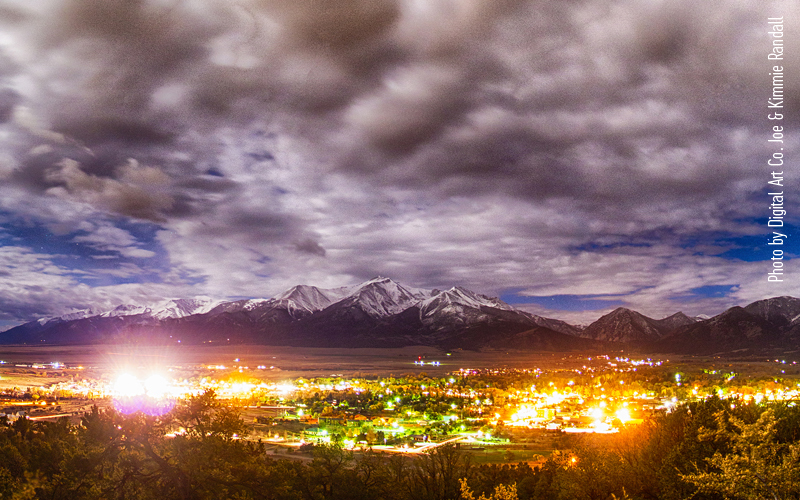 They offer amazing views of the Collegiate Peaks and the Arkansas River. 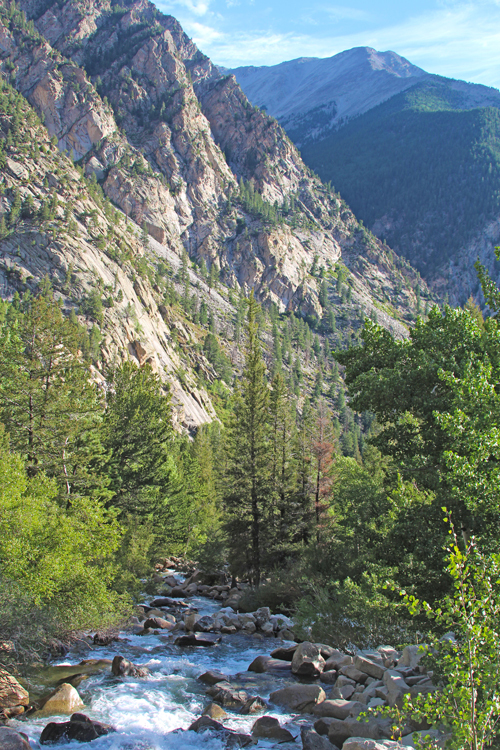 Purchase a copy of “Hiking in Buena Vista” book for your own variety of hiking trails. Please see a variety of hikes below. The Colorado Trail is accessible from different spots within our area. Check out the State’s Colorado Trail Explorer website for more information on the Colorado Trail. 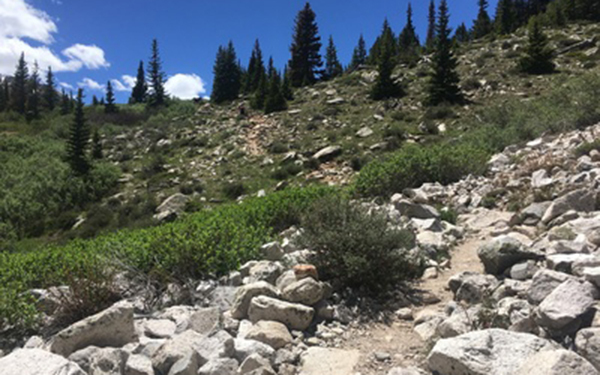 No matter the trail difficulty level, hiking in Buena Vista can be challenging at first because of the high altitude. But with proper hydration, nutrition, gear and attire, you’ll be ready for a fun adventure in the Colorado Rockies. Town Hikes: Barbara Whipple Trail, Midland Hill & more! 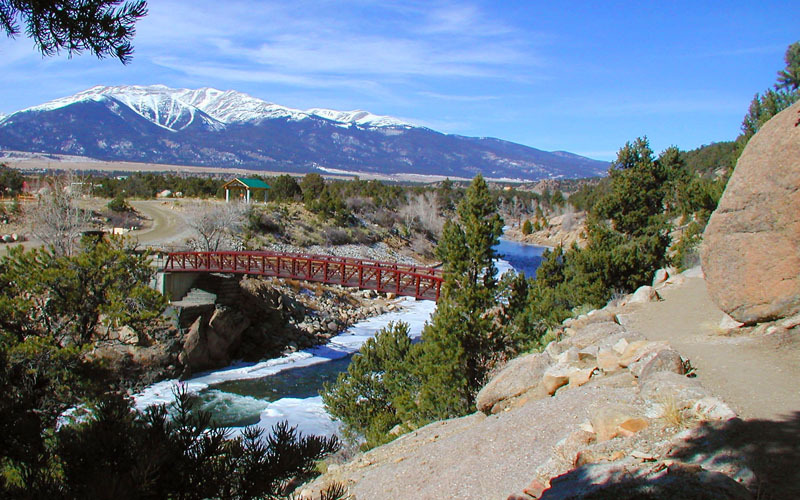 The Buena Vista River Park Bridge connects to the Whipple Trail System, the Midland Bike Trail and the Fourmile Travel Management Area – 100,000 Bureau of Land Management and Forest Service acres. The Town of Buena Vista offers a detailed brochure on the Whipple Trail System (excerpts are shared here). This trail system offers spectacular view sheds of the 14ers in our valley, the Arkansas River and unique rock outcroppings. Click here for trail map. Access the River Park Bridge by going east on Main Street until it dead ends and parking to the left by the soccer fields. Access the River Walk by taking a right and parking in South Main. Both East and South Main Streets are excellent for shopping, dining and celebrating our rich mountain history and town. Whipple Trail System: Begins at the East side of the Arkansas River it offers circular routes at a variety of grades and trail lengths: Whipple Main Route, South Loop (6032), Steep Shortcut, North Loop (6030), Broken Boyfriend (6032A), Midland Bike Trail and Midland Hill Trail. Very enjoyable and popular day hike or overnighter. The lake is very picturesque and well known for Cutthroat Trout fishing. There are many side hike opportunities from the trail. Directions: to Cty. Rd. 365: From Main St./Hwy. 24 Stoplight in Buena Vista, travel North .3 mile; West (L) on Crossman Ave./Cty. Rd 350. Drive 2.1 miles to Cty. Rd. 361; turn North (R) and travel 1.0 mile. Turn West (L) onto Cty. Rd. 365; travel 5.5 miles to the Trailhead. Park. #1448 Trail Info: Cross North Cottonwood Creek on wooden bridge at .12 miles; cross small stream at 1.44 miles; make a second crossing of North Cottonwood Creek on wooden bridge at 1.58 miles. At 1.64 miles trail splits; take left trail to Kroenke Lake. At 2.59 miles cross stream on log bridge. Make two more stream crossings to sub-alpine valley at 4.0 miles. Kroenke Lake is at 4.3 miles. Very scenic valley and mountain views and beautiful alpine lakes. After some elevation gain, trail becomes level. Directions: to Cty. Rd. 365: From Main St./Hwy. 24 Stoplight in Buena Vista, travel North .3 mile; West (L) on Crossman Ave./Cty. Rd 350. Drive 2.1 miles to Cty. Rd. 361; turn North (R) and travel 1.0 mile. Turn West (L) onto Cty. Rd. 365; travel 3.5 miles to the Trailhead. Park. #1776 (N) Trail Info: You will be hiking the Colorado Trail (N) to Harvard Lakes. First .75 miles is 600 feet of elevation gain, followed by a small ascents/descents. At .26 miles, switchbacks offer great views of Mt. Harvard. 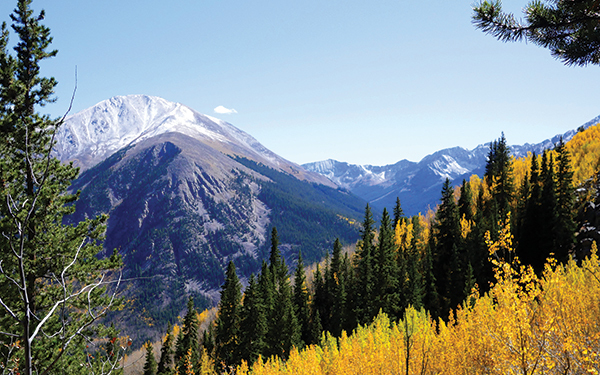 Hike through alpine forests of pine and aspen continuing uphill. At 1.31 miles enter open clearing to view Mt. Princeton and the Upper Arkansas River Valley. At 2.35 miles, cross small stream, continue ascent. At 2.55 miles, cross a second stream, continue ascent. The larger Harvard Lake is at 2.80 miles and the smaller one is at 2.99 miles. Popular and picturesque hike following beautiful North Cottonwood Creek; waterfalls and rushing rapids. This short mountain hike is the start for both Kroenke and Bear Lake Trails. Trail Info: Cross North Cottonwood Creek on wooden bridge at .12 miles; cross small stream at 1.44 miles; make a second crossing of North Cottonwood Creek on wooden bridge at 1.58 miles. Turn around or continue on trail where it splits to Kroenke or Bear Lake. Scenic trail with views of the Swatch Mountain Range. Blue Spruce forests and wildflowers follow Green Timber Gulch; cascading water and small waterfalls. on Cty. Rd.306/Cottonwood Pass. Travel 6.8 miles to left turn onto Cty. Rd. 344; proceed 6.8 miles to Trailhead on left; need high clearance vehicle for last .8 mile. Trail Info: Cross the bridge over South Cottonwood Creek at .40 forge Green Tree Gulch stream. At 1.28 miles the trail opens up to a stunning view of Green Tree Gulch. At 1.48 miles where you forge a second stream the trail turns immediately LEFT, do not take the trail up the stream. At 2.0 miles enter the sub-alpine meadows that are full of willows, spruce and shrubs. At 2.40 miles you will begin your final ascent to the pass which is a glacial formed valley. You will see great views of Mt. Elbert (14,439’), the highest 14er in our area. 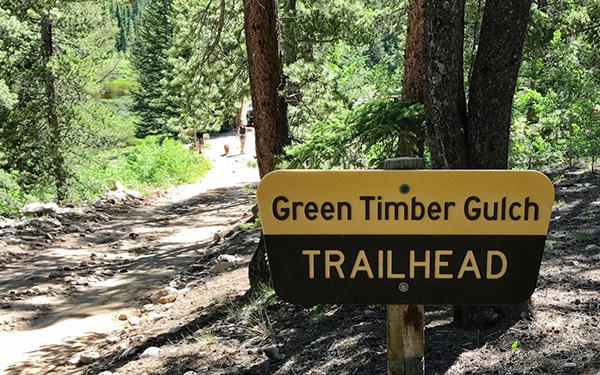 At 2.67 miles the Green Timber Gulch Trail connects with Poplar Gulch Trail. 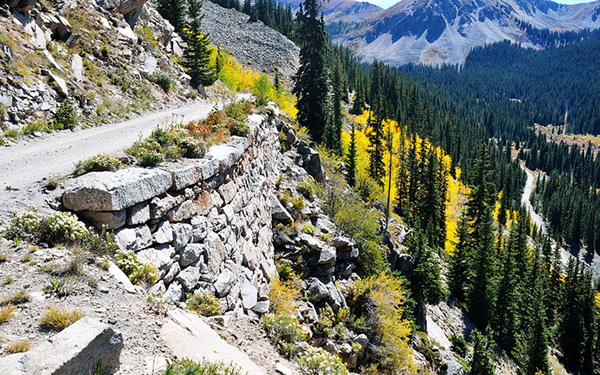 Trail starts outside St. Elmo, an historic mining/ghost town at the base of Tincup Pass. Travel through forests of pine and aspen then ascend mountain switchbacks along a rushing creek to meadows of flowers, mountain vistas and headwaters of Chalk Creek. Directions: From Main St./Hwy. 24 Stoplight in Buena Vista, travel 8 miles on Hwy. 24/285. Turn West (R) on Cty. Rd. 162; travel 15 miles to town of St. Elmo. In town turn right on road to Tincup Pass/FR 267. Cross bridge; turn West (L). park/hike .2 mile up Tincup Pass Road to Trailhead. Trail Info: Begin hike through closed gate; Trail starts level; at .65 miles ascend first of four steep switchbacks. At 1.25 miles Trail merges with creek; cross creek, enter a glacial formed valley and sub-alpine meadow. At 2.26 miles arrive on knoll; turnaround here for a shorter hike or continue on trail for 1.84 miles for a longer hike to Poplar Gulch Pass. You may connect this Poplar Gulch Trail with the Green Timber Gulch Trail (shown on left) off of Cty. Rd. 344 for a one-way hike with incredible vistas. Distance: 7.2 miles to Poplar Gulch Pass miles round trip. Or 4.5 miles round trip for shorter turnaround. Elevation gain: 2200’ full hike or 1,262 for shorter hike. Trail, with Interpretive signs, follows the old Denver, South Park and Pacific RR route from Hancock to the East Portal which tunneled under the Continental divide to the Western Slope of Colorado. Portal collapsed; not accessible for entry. Alternate routes to West Portal and Tunnel Lake are available. Directions: From Main St./Hwy. 24 Stoplight in Buena Vista, travel 8 miles on Hwy. 24/285. Turn West (R) on Cty. Rd. 162; travel 15 miles; turn South (L) onto Forest Route 295; travel 5.7 miles to Hancock, deserted buildings. Proceed to Trailhead over Chalk Creek Bridge. Trail Info: Trail starts west of the bridge; use right fork titled Alpine Tunnel Trail. At .5 miles follow right fork over low gate. Important trail junction at 2.8 miles: stay on RR bed all the way to the Alpine Tunnel East Portal; OR ascend steep switchback trail 3.30 miles to West Portal; OR follow West Portal Trail 3.2 miles to junction; right turn and hike 1.2 miles to Tunnel Lake. Distance: 5.8 miles round trip to East Portal. 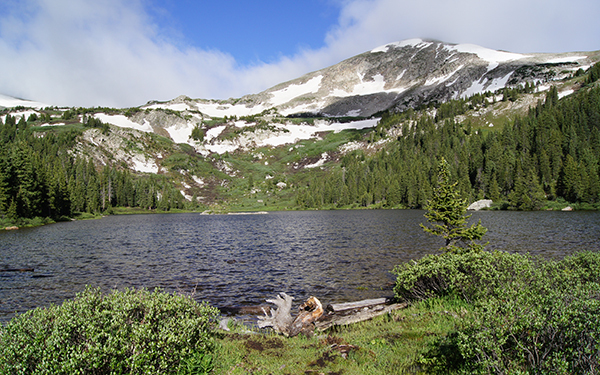 This hikes provides several stunning options: hike to and camp at Brown’s Lake (12 mi. RT); shorten your hike along Brown’s Creek to waterfalls; access the Colorado Trail at 1.41 miles; or a 3.6 mile loop return to Trailhead. Great views of the Upper Arkansas River Valley. Directions: From Main St./Hwy. 24 Stoplight in Buena Vista, drive south on Hwy. 24/285 Eleven miles; turn right (west) onto Cty. Rd. 270; drive 1.4 miles to Cty. Rd. 272 and continue 3.7 miles to the Trailhead. Trail Info: Begin hike through closed gate; steep climb to the right. At .41 mi. walk along ridge. At 1.33 mi. view beaver ponds on Little Brown’s Creek. At 1.41 mi. follow upcoming signs as you desire onto the Colorado Trail, Brown’s Lake, Brown’s Falls or return to Trailhead via Wagon Loop Trail. Note your route to avoid confusing trails. Distance: 12 miles round trip to Brown‘s Lake. Waterfalls 6+ miles round trip. Loop trail 3.9 miles round trip. Awe-inspiring trail through Fourmile Travel Management Area with outstanding views of the Sawatch Mountain Range and our valley. 2.4 miles to stoplight; make left turn (East) unto Hwy. 24/285. Drive 7.4 miles; make left turn onto Cty. Rd. 309 (also known as Seven Mile Creek Rd. ); Drive 2.9 miles; turn left onto Cty. Rd. 311; travel .6 mile to Trailhead sign and parking. Trail Info: From Trailhead, hike .14 miles; open gate with trail sign #1413. At .44 miles cross small stream and begin ascent with several switchbacks marked by carins. At .7 miles creek on left; enter forest; pond on left at .9 miles. At 1.7 mile view and descend into Davis Meadows with deserted cabins ahead. May continue on trail or return to Trailhead. 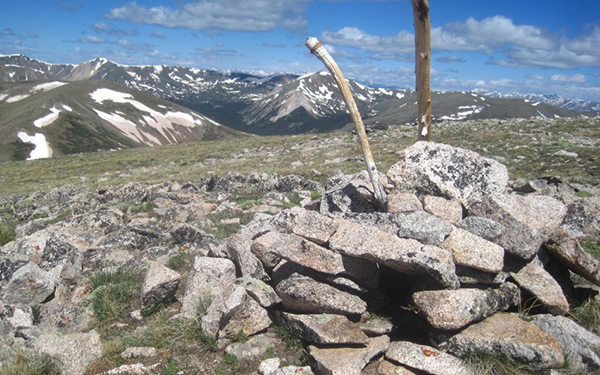 Also known as “Fourmile Creek Trail” a niche day hike or overnighter into the Buffalo Peaks Wilderness Area. Directions: From Main St./Hwy. 24 Stoplight in Buena Vista, turn East on Main St.; left turn onto N. Colorado Ave./Cty. Rd. 371. Drive North 3 miles; right turn onto Cty. Rd. 375, Continue 6 miles to Trailhead. Trail Info: From Trailhead sign, head North and follow creek 3 miles in valley with beaver ponds to saddle west of Buffalo Peaks. Hike another mile to beautiful meadows; turn around. A side hike East from the saddle to Buffalo Peaks is possible; add 1.5 miles and 2,000’ of elevation gain. Stay on the trail; please do not walk on the delicate alpine tundra. The path to Lake Ann offers hikers a serene experience, with impressive views of various mountain peaks. On the way, you’ll view the Three Apostles peaks and Mount Huron, both of which are noteworthy sights. Remember to bring lunch and or some snacks so you can stop at the lake to soak in the Rocky Mountain views and shimmering turquoise water. 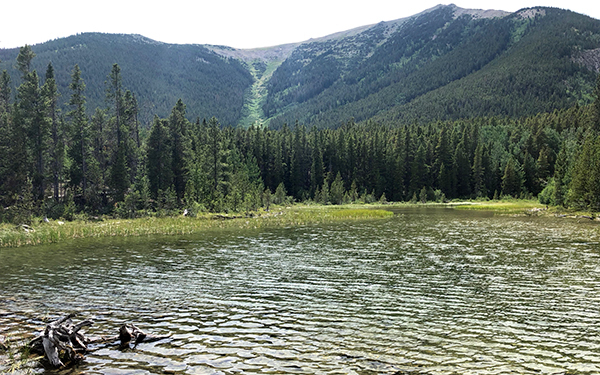 Lake Ann is also a good fishing spot, with 8-16″ native cutthroats that are ready to bite a dry fly. Directions: To reach Lake Ann, head north out of Buena Vista on Highway 24 North for about 15 miles as you head toward Clear Creek Reservoir. Turn left to travel west on County Road 390 and continue for about 11.6 miles. Once you reach the ghost town of Winfield, turn left onto a small dirt road (FR 390.2B). After 0.1 miles, you’ll see a parking and camping area to your left. If you don’t have a four-wheel drive vehicle, you’ll have to park here and hike about 2 miles to the trailhead. If you do have a four-wheel drive vehicle, continue 2.1 miles on a rough section of road to the trailhead (when you reach 0.7 miles past Winfield, the road becomes a junction where you must turn right). Stay on this road until you see the parking lot. Elevation: 10,560 ft. – 11,811 ft.
A steep, rocky trail to Hope Pass among pine forests, lush Aspen groves and alpine tundra. 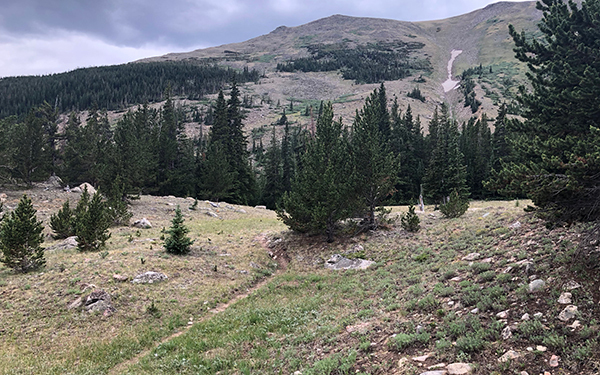 Route follows a section of the Continental Divide Trail offering exceptional views of the Collegiate Peaks and surrounding 14,000 ft. mountains. Directions: From Main St./Hwy. 24 Stoplight in Buena Vista, drive 15 miles North to Cty. Rd. 390. Turn West (L) and drive 9.4 miles to large parking area/Trailhead on North (R). Trail Info: Begin steep, rocky uphill climb. At .45 mile begin long hike through lush Aspen grove; cross small stream at .70 mile; at .97 mile cross major rock slide. At 1.96 mile view overlook of Clear Creek Canyon. At 1.15 mile cross small stream, rock slide and second stream. At 1.25 mile great photo opportunity/turnaround point for shorter hike. At 1.62 miles follow route through rocks and sub-alpine hiking. 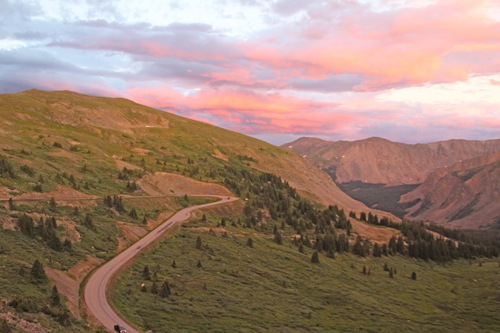 Enter alpine tundra at 1.84 miles; reach Hope Pass at 2.63 miles with breathtaking 360 degree views.